After data collection, most Psychology researchers use different ways to summarise the data. In this tutorial we will learn how to do descriptive statistics in Python. Python, being a programming language, enables us many ways to carry out descriptive statistics. One useful library for data manipulation and summary statistics is Pandas. Actually, Pandas offers an API similar to Rs. I think that the dataframe in R is very intuitive to use and Pandas offers a DataFrame method similar to Rs. Also, many Psychology researchers may have experience of R.
Thus, in this tutorial you will learn how to do descriptive statistics using Pandas, but also using NumPy, and SciPy. 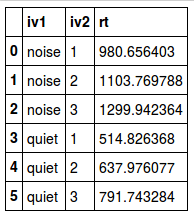 We start with using Pandas for obtaining summary statistics and some variance measures. After that we continue with the central tenancy measures (e.g., mean and median) using Pandas and NumPy. The harmonic, geometric, and trimmed mean cannot be calculated using Pandas or NumPy. 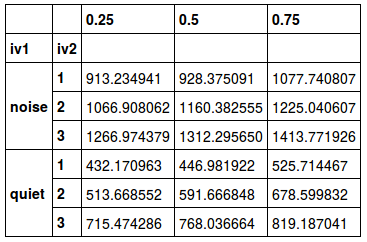 For these measures of central tendency we will use SciPy. Towards the end we learn how get some measures of variability (e.g., variance using Pandas). Many times in experimental psychology response time is the dependent variable. In this example, we simulate an experiment in which the dependent variable is response time to some arbitrary targets. 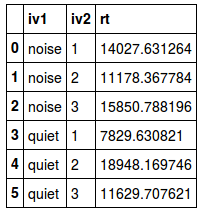 Furthermore, the simulated data will have two independent variables (IV, “iv1” have 2 levels and “iv2” have 3 levels). Here, the data are simulated as the same time as a Pandas dataframe is created and the first descriptive statistics is obtained using Pandas describe. In the example above we simulated data. We can, of course, use our own stored data. If you need how to work with Excel files see this Pandas read and write Excel files tutorial. 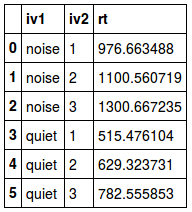 Pandas will output summary statistics by using this method. 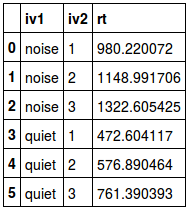 Output is a table, as you can see below. Typically, a researcher is interested in the descriptive statistics of the IVs. Therefore, I group the data by these. Using describe on the grouped date aggregated data for each level in each IV. As can be seen from the output it is somewhat hard to read. Note, the method unstack is used to get the mean, standard deviation (std), etc as columns and it becomes somewhat easier to read. Often, we want to know something about the “average” or “middle” of our data. Using Pandas and NumPy the two most commonly used measures of central tenancy can be obtained; the mean and the median. Moreover, the mode and the trimmed mean can also be obtained using Pandas but I will use methods from SciPy. Both methods will give the same output but the aggregate method have some advantages that I will explain later. Sometimes the geometric or harmonic mean can be of interested. These two descriptive statistics can be obtained using the method apply with the methods gmean and hmean (from SciPy) as arguments. That is, there is no method in Pandas or NumPy that enables us to calculate geometric and harmonic means. Trimmed means are, at times, used. Pandas or NumPy seems not to have methods for obtaining the trimmed mean. However, we can use the method trim_mean from SciPy . By using apply to our grouped data we can use the function (‘trim_mean’) with an argument that will make 10 % av the largest and smallest values to be removed. 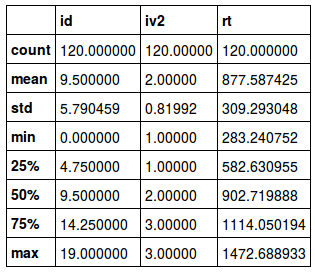 In Python, using Pandas, there are two methods to calculate the median. In the example below we use Pandas median and aggregate together with NumPy’s median. Output of aggregate using Numpy – Median. There is a method (i.e., pandas.DataFrame.mode()) for getting the mode for a DataFrame object. 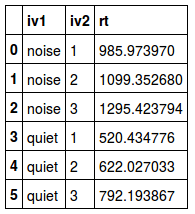 However, in this example we use mode from SciPy because Pandas mode cannot be used on grouped data. Most of the time I probably would want to see all measures of central tendency at the same time. Luckily, aggregate enables us to use many NumPy and SciPy methods. In the example below the standard deviation (std), mean, harmonic mean, geometric mean, and trimmed mean are all in the same output. Note that we will have to add the trimmed means afterwards. Output of aggregate using some of the methods. Central tendency (e.g., the mean & median) is not the only type of summary statistic that we want to calculate. We will probably also want to have a look at a measure of the variability of the data. In this example, we will use Pandas quantile to calculate the IQR. Note that here the use unstack() also get the quantiles as columns and the output is easier to read. 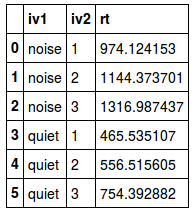 Variance is easy to calculate using Pandas. In the example below we use the var method to carry out the calculation together with the reset_index method. That is all. Now you know how to obtain some of the most common descriptive statistics using Python. Pandas, NumPy, and SciPy really makes these calculation almost as easy as doing it in graphical statistical software such as SPSS. One great advantage of the methods apply and aggregate is that we can input other methods or functions to obtain other types of descriptives. Update: Recently, I learned some methods to explore response times visualizing the distribution of different conditions: Exploring response time distributions using Python. I am sorry that the images (i.e., the tables) are so ugly. If you happen to know a good way to output tables and figures from Python (something like Knitr & Rmarkdown) please let me know.